I have applied for PF and amount came to my account, but meanwhile i was closed that account, second time i opened new account and sent complete one more set of PF documents, but not received any amount and was working in that company 2006 to 2008. And now as confirmed by my company PF consultant, we need to send re-authorization letter with passbook copy..
Only front copy of passbook is sufficient or do we need to send latest statement also.. plz guide me. Only front copy which consists your photo will be enough or you can also submit a canceled cheque. I had applied for pf advance of amount @000 on 11.2.2019. The same got settled on 12.2.2019.Meanwhile i noticed my entered bank details were wrong and immediately i had upgraded my correct bank details. The same got approved by my employer. Again i withdrawed some amount and got credited into my account. But my first withdrawed amount is neither credited into my bank account nor in my pf account. The status of first advance is changed from settled tp settle but returned. I raised grievance in portal to which i was asked to submit reauthorization form. can i cancel my first pf advance online? As i came out of my previous employer, can i submit reauthorization form with duly attested by my bank manager instead of my employer ? I am not having any cheque book so what should i submit in place of cancelled cheaque? Please reply with any contact number of epfo. my location is in hyd. The uncredited PF advance amount will credit back into your PF account within 10-15 days, after that you can again claim it (Or) you can also submit PF reauthorization form along with your bank passbook copy. I have submitted my reuthorisation claim by post and through mail repeatedly but amount not credited to my account. Please raise a grievance at PF portal so that you can know the exact reason for the delay. As informed by you, had reapplied for partial withdrawal online before the amount was credited back to EFP and as the claim settled amount was not credited after 1 week also. Now reapplied is rejected saying claim already settled. Now do I need to send ASR form and who has sign in employer place and has it to be submitted physically to EPF office or can be couriered. It needs your employer signature i.e who is responsible for PF in your company and it is better to submit ASR by hand. My name is Ajit, I have applied online for PF transfer from previous employer to current employer. Current employer is trust and in form 13 trust account details are mentioned. EPFO settled my transfer claim but after few days they updated claim status as cheque return back to EPFO. Can you please guide me what to do in this case. can I submit reissue performa with current employer’s Trust account details ? It is better to submit a grievance at PF portal so that you will know the exact reason form your concerned EPF branch office. my epfo amount setteled but return neft please help me withdraw my amount. Hi Manamohan, Submit PF reauthorization form to PF office along with a canceled cheque. Hi Manamohan, Submit PF reauthorization form to PF office along with canceled cheque. when i claimed my epf then my account no. was wrong on the portal but now i have submit my correct account and my employer pass it. but on the homepage it is showing my wrong account no. and my pf is settled any the amount is not credited in my account. You have to reapply for PF claim again, but before that make sure your employer has approved your new bank account details with their digital signature or not. If they approved then they will appear under the verified section in UAN portal, otherwise, they don’t appear. 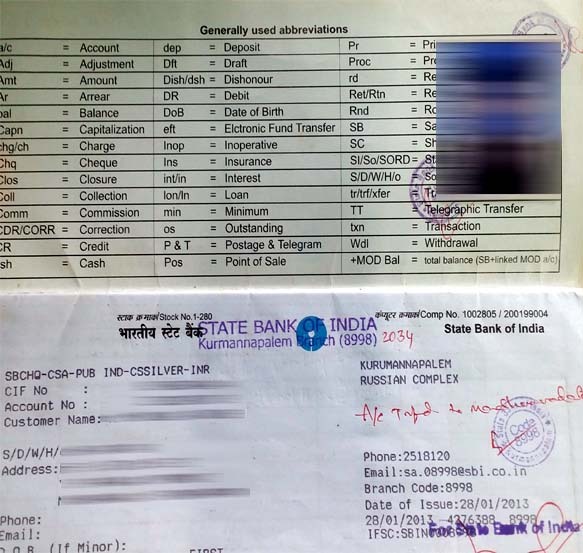 I had applied for partial pf withdrawal online and shows claim settled but amount not credited. As per your above comments you have told to reapply if applied online, but in some websites they have posted as it will get rejected if reapplied and have to submit reauthorisation form for online applied also. Kindly please clarify this. Also please let know should I wait till the amount is reversed back to EPF and then reapply for withdrawa. Yes, you can submit PF reauthorization form for online claims also, but if you don’t want to visit your PF office then you can reapply online at UAN portal. You don’t need to wait for credit back of your PF claim amount into your PF passbook. If you have claimed your PF online then correct your bank account details online and reapply for PF after employer approval. If you have claimed it offline then submit PF reauthorization form to your PF office. On 08 january 2019 I have online claimed pf withdraw claim settled but in that I given wrong account number but IFSC code is correct can I get money to my account . I got mail that you claim settled . What should I do to get my money. If your bank account number is wrong then you don’t get your claim amount. Now correct your bank account details at UAN portal and ask your employer to approve them. Once they approve them then the new a/c details will become active, once they become active then again claim your PF amount. The present settled amount will be sent back to your PF account in 7-10 days. But before reapplying make sure your bank account details are corrected or not. 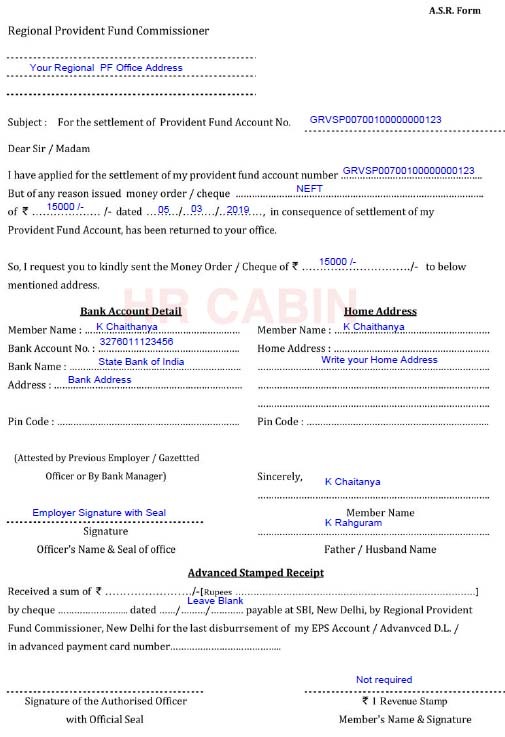 Hi ,, I claimed my PF and the status was showing like money was settled ,but not yet credit to my bank account ,, If I am submitting ASR form to PF office to whom can I get employer signature from my working office who are all having authority to give attestation for employer signature .. It depends on your regional EPF office, if you are lucky then they accept it. But if they reject then next time take your employer signature. My PF advance against form 31 claim settled and returned. For this to whom I have to send my reauthorization form. Please advise this ASR form is enough for that. and also My name in Bank account is Hanumantha Rao Gorla and in PF account it is Gorla Hanumantha Rao is there any problem. You are telling that already your PF claim was settled, so don’t need to change your name, just submit PF reauthorization form to your regional PF office along with a canceled cheque. You have to correct your IFSC code before applying for PF claim and, updating is not just enough those bank account details have to be approved by your employer. If you have done all those things then you will get your PF claim amount otherwise you need to reapply again after doing all these. I have requested for Online EPF Advance (form 31) but when check also same amount shows debited (withdrawal) into PF account but still not credited in given bank details. when I check then found that Bank a/c no. was correct but IFSC code is of other Branch that’s why it may be possible not to be credited. what will happened now in this case? Amount will be credited return automatically to my PF account? or have I need to do any process? let me know your valuable suggestion what I have to do? My claim status says Settled through NEFT. My name in Bank is Shiva Prakash Odayar and in UAN it’s Shiva Prakash but other Bank Details like account number and IFSC code is correct. Will there be any issue money coming to my account? I think it may not be a problem. On agust 2018 I have online claimed pf withdraw claim settled but in that I given wrong account number but IFSC code is correct can I get money to my account . I got mail that you claim settled . What should I do to get my money. If bank a/c number is wrong then you can’t get your PF amount, If you claimed your PF amount offline then submit PF reauthorization form or if you claimed PF online then correct your bank a/c details and tell your employer to approve them. Once they get approval then claim it again. My name Sakshi and even after mentioning the correct account details and submitting the online claim, I have still not received my PF amount, what is the use of getting things online when PF office people can’t handle it gracefully. This is heights of irresponsibility and wasting precious time and money of people as your office is in Gurgaon and people live so far, for such petty issue you compel them to come to your office and again resubmit everything. Is this a joke? I submitted my claim on 26th June 2018, since then I am seeing the status claim settled for UAN – 100982824167. It says payment was sent through NEFT 11th July 2018. I have checked several times with my previous office and on UAN portal as well the account number I mentioned and approved by PF staff is correct. I have all the screenshots to prove it. Also, I live too far from Gurgaon in Delhi, it takes 1.5 hours to travel one side to reach Gurgaon, even more, depending on traffic. Do you people think there is no value for other people’s time and money? For such small issues, a person has to invest almost the whole day and then you want them to reclaim and again get it authorized by the employer. Your complaints should reach PMO office I guess and even above on higher levels as when we call, no one answers, when we email, no one answers, even I logged a complaint in the grievance. its been more than 2 months I am still waiting for my claim amount. This is highly irresponsible and a waste of time and money. If manual things to be done again then what is the use of online claim? Are you sure your staff is capable of typing correct account numbers and details for the claims (if applicable) and not just imposing later on us that we mentioned details incorrectly? Everything is correct in my case…may I know now why for this issue I have to come to PF office? as this is heights of such delays. Also, I have not received even a single message on phone or email about status or credit of payment etc. Am working in Coimbatore branch organization. But My PF account was in Delhi. I have applied withdrawal via online. After EPF amount settlement my amount was return by Bank because some issue. Can I send ASR form via post? or can I Submit ASR form in Coimbatore Branch? You have to submit ASR form to Delhi PF office either through courier or by hand. You can also do one thing correct your bank account details online and tell your employer to approve them and claim PF amount again in online.